Before I started Banting my husband and I were very overweight and knew for a long time we had to do something, but both of us were so tired of trying and failing. At the beginning of February 2012, with both of the children gone off to university, we decided to try and cut out all carbs. My husband(age 48) weighed 136kg and I (age 49) weighed 95.5kg. Then we heard Dr. Tim on Carte Blance and I googled some of his articles and that changed our whole perspective! 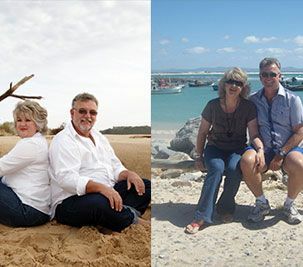 My husband lost 36kg and I lost 19kg by December 2012! I had a constant problem with IBS. I use to wake up at night of stomach ache. Since that February it was something of the past. My husband’s blood pressure was so high he bought a blood pressure machine to monitor himself. His blood pressure was normal! It has a snowball effect because the moment we ate the right food, we had the energy to be more active. It has been so rewarding to put away the big clothes and start wearing the smaller clothes that I had no hopes of wearing again! People are astonished to see my husband, and everybody wants to know the secret! We gladly refer them to your articles!